The economy is projected to add 11.5 million jobs over the next decade, with the bulk in health care, according to the Bureau of Labor Statistics. 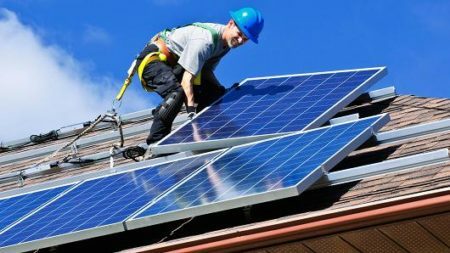 In percentage terms, the biggest growth will come from solar panel installers at 105.3 percent — from 11,300 now to 23,200. The projections come amid the slowest year for job growth since 2010, as the economy was still reeling from the financial crisis. The Energy Department recently awarded $1.5 million to six companies working to slash the cost of distributed wind power. This entry was posted in NewsBlog and tagged electric buses, EPA Green Power Award Winners, global solar energy market, global wind energy market, renewable energy jobs, solar panel installers, U.S. solar and wind energy development on October 26, 2017 by Helen Deffenbacher.